Bromley residents face the prospect of uncollected rubbish as about 100 refuse collection staff employed by waste disposal giant Veolia gear up for three days of strike action in a pay dispute. About 100 workers, members of Unite, voted 85% in favour of striking on 24 August and 3 and 4 September, after years of below inflation pay awards. The strikes will run from midnight to midnight. Veolia was awarded the contract by Bromley council – and Unite said that this dispute was another example of the flawed nature of the controversial authority’s mass privatisation programme which relies on cutting services and slashing wages. 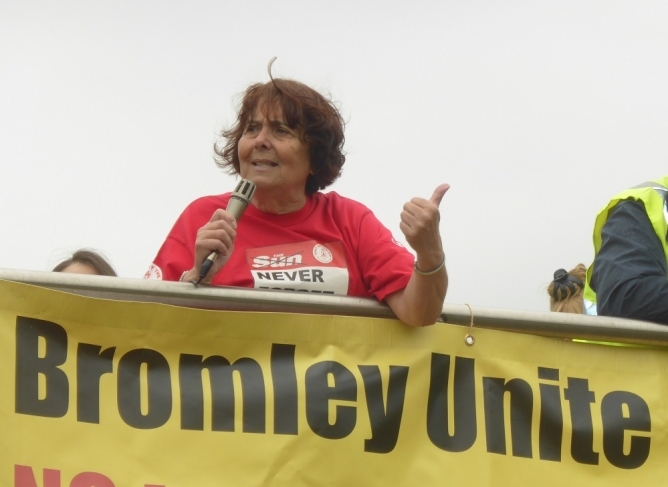 Kath Smith the Unite branch secretary spoke at a recent Unite LE1111 meeting outlining the struggle in Bromley – see here for more. Unite regional officer Onay Kasab said: “Employers have offered 1.5% for the pay year starting last April - and we put in for a 4% pay rise. Workers are angry, as they have to cover heavier and heavier workloads following a number of rounds being cut. “For years they have had below inflation pay rises – but now that inflation has dropped, the employers are happy to use it as a bench mark – so it’s a catch-and-match up claim. “Our members have made it very clear that they are prepared to strike – we held three consultative votes, all of which voted to be balloted for strike action. “Veolia should have got the message – but it clearly hasn’t. That is why we have now issued notice for strike action. This is a very unhappy and demoralised workforce, being asked to take on more work but not being recognised for it. “Veolia has a final chance for talks – we urge them to take that opportunity. The alternative is for the strike to go-ahead with the prospect of uncollected dustbins causing a stink in the late summer sunshine. “The collection service will be a day behind initially and the further two days of action will hamper efforts to catch up and cause the service to householders to lag further behind. The Conservative-dominated council is fully committed to becoming a commissioning council and reducing the number of council employees from 4,000 to 300 – despite having £130 million in reserves. The council is considering the privatisation of 14 libraries, replacing staff with unpaid volunteers and handing the libraries over to charities. The council has also agreed to privatise learning disabilities services by handing them to another private company, Certitude which could lead to more job losses. The campaign is a set of proposals that Unite in local government is putting to councils in the region. It is a procurement strategy to ensure that quality services are maintained and that there is no ‘race to the bottom’ for pay and conditions post any transfer. In our sector of the union we have been campaigning for ‘sector standards’ and a national agreement.